Bass (and mullet) in numbers. "I couldn't get interested in fishing - sitting there doing nothing for hours on end would bore me to death!" This is a typical remark of a non-angler and it may well have a grain of truth when it comes to the traditional approach to our sport. However, my own angling involves a hell of a lot of walking. Since I got back from Brazil I've already walked many miles of shoreline to see how things had changed while I was away. What is clear is that there have been some big storms in the recent past. Along many stretches there are huge mounds of seaweed cast up along the high water mark. In two places (probably three miles apart) there are massive accumulations of weed, a metre or more in thickness. A quick scrape of the boot shows that just beneath the surface of the mounds are millions, nay billions, of Coelopa maggots - sheer ambrosia for mullet and bass. 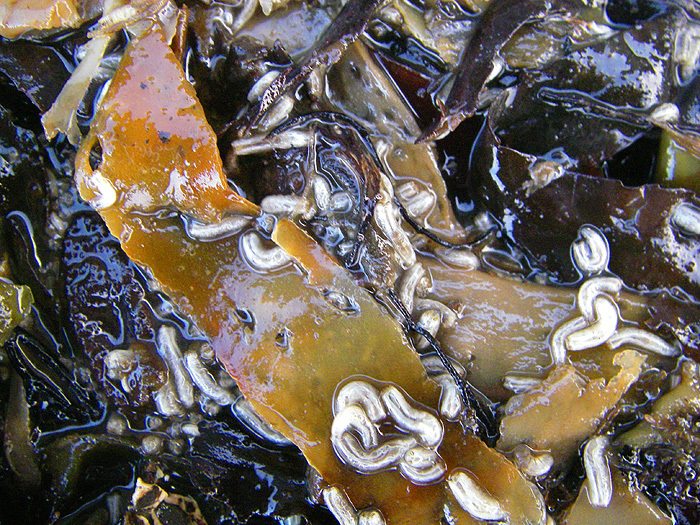 Anyway, I decided that the first decent spring tide (last Sunday as it happens) would wash maggots into the sea and attract the fish in to feed. I had to choose which location I was going to fish so I tossed a coin and opted for the one furthest to the east. I rang Nigel to let him know where I was going and sure enough, when I arrived, he was already there. My pals Dave Baker and Mike Oliver arrived about the same time as me so there were four of us fishing. We were armed with fly rods and spinning rods and before the fish arrived in numbers we tried the latter. 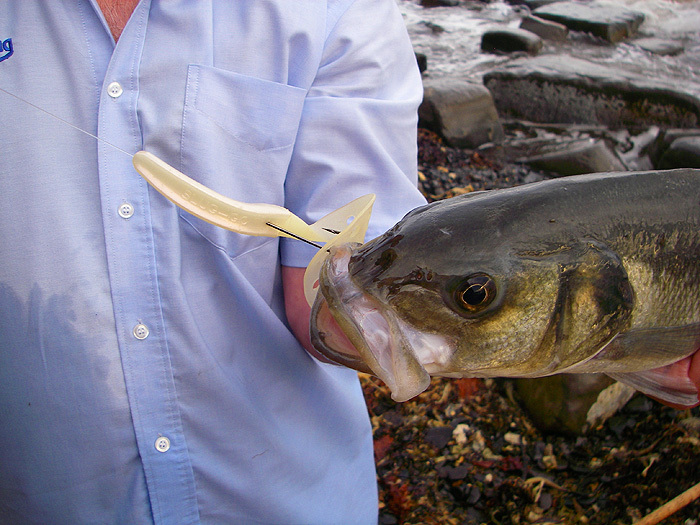 It's sometimes possible to pick up a decent bass before any maggot feeding fish are visible. 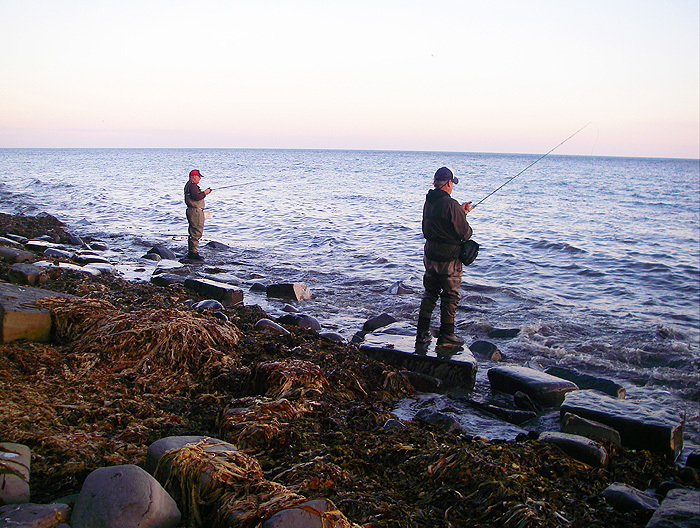 It wasn't long before the first mullet appeared, cruising on the surface, so Nigel and Mike picked up the fly rods. Dave stuck to spinning with a tiny white Redgill/Delta and I was trying a new 15cm softbait with integral hooks that I'd been given. To cut a long story it was soon apparent that the flies had it. I had a few takes from bass but none of them was hooked so I switched to a little fat surface plug with a propeller at the back (also a gift). The plug elicited little interest from fish although, in different circumstances, it will probably be effective. After half-an-hour I also switched to the fly rod with a white Redgill in lieu of a fly. At once I caught bass. 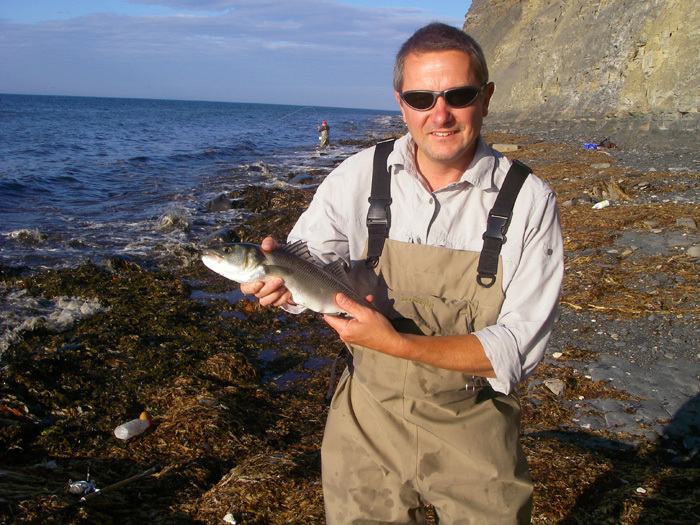 In fact we all caught bass and the maggot fly (used for a short time by me and Nigel) also produced a couple of mullet. Had we brought any maggots the mullet sport could have been spectacular because the fish were only a metre or two from the edge, however, we had plenty of fun catching bass - the best being Nigels six pounder on his fly rod. The following evening was, if anything, even better, although the stronger breeze and rougher sea made fly fishing a bit tricky. One or two of us had sessions of weed dragging when waves drowned the flyline in the edge. 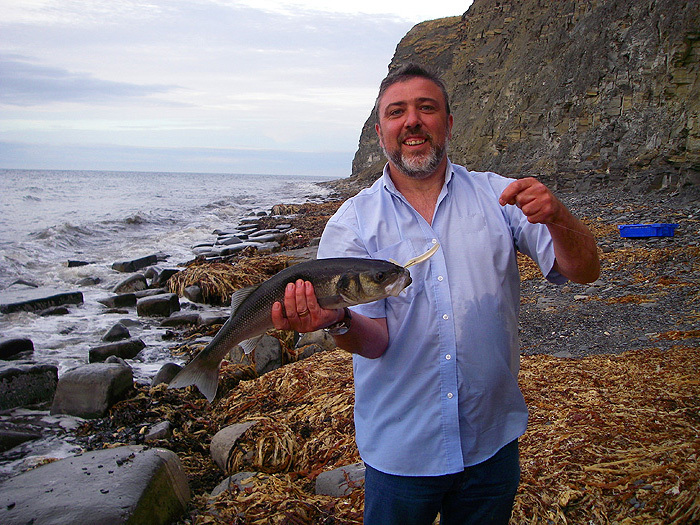 I went again on the third evening tide, this time with my son Marc and his lad Ben. this time it was pretty calm. Now Ben's a keen angler but his dad hasn't been fishing for years so I rigged each of us with different gear. I took the fly rod with a Delta eel attached, Ben had his spinning rod with a bouncy-ball float followed by a Delta eel on a trace and Marc was given my 4Surespin rod with a new bait attached. I say a new bait in fact it was a hybrid that I'd made that afternoon. It's probably worth an explanation. 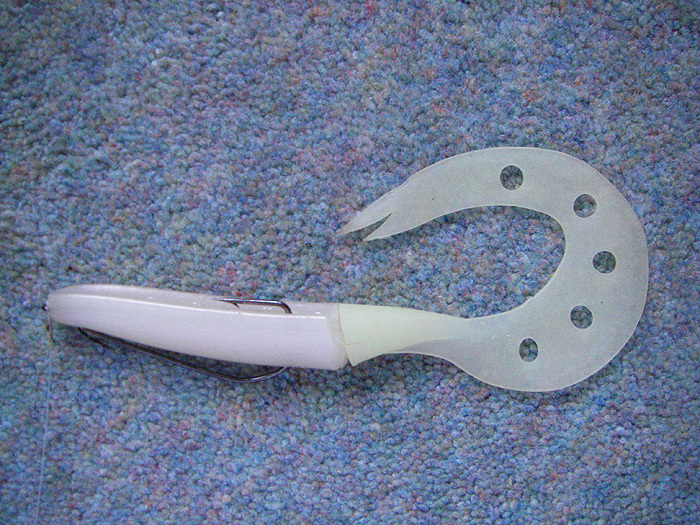 For some time I've been using 'Texas rigged' soft plastics to avoid weed. The lures in question have very little intrinsic action and require a fair bit of rod-and-reel-work to make them effective. If there's little or no drifting weed wiggly tails or paddle tails are much more attractive and they are certainly easier to use - all you do is wind them slowly in. What I thought was 'why not combine the two assets?' So - I butchered a Slug-Go (front half) and a Sandra (back half) and glued them together producing a weedless wiggly tailed lure. This is what I gave Marc, thinking that it would be easy for him to use. The instructions were hold up the rod and wind slowly. The idea was fine and worked a treat. Marc landed four bass and missed several more. Young Ben's rig, in contrast, was a nightmare and eventually he lost it wrapped in several kilogrammes of weed. I had a fish or two on the fly but I stopped fishing to try and help my grandson. It just wasn't his night. I switched him to a softbait but he couldn't get a sniff - just one of the lessons of fishing I'm afraid. The number of times I've watched other people catch while I observed are too numerous to count. Next time Ben!!! !